The aspiring adventurer knows the importance of a heavy duty boot for off-road use. TCX has always excelled in this category, but they will be pushing the limits even further for 2013. 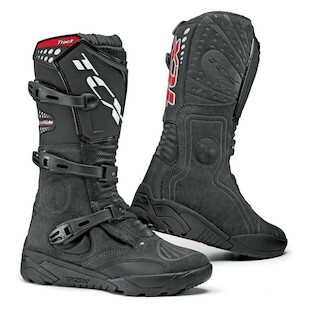 The TCX Track Boots are a high octane solution for an efficient price. 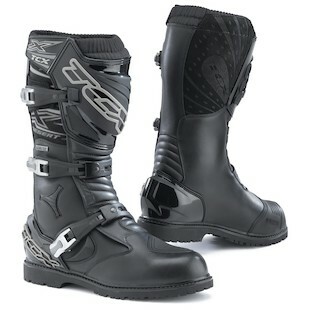 Three heavy duty buckles and a high-calf fit give support for the challenges of the dirt. Though the Track boots are technically an entry level option for the category, don't forget that "entry level" for TCX includes complete protection at the shin, ankle, heel, toe, and instep. In addition, the aggressive sole and wear-resistant compound set this boot apart from being hardly entry level in quality and features. For the seasoned adventurer, the TCX X-Desert Gore-Tex Boots offer a level of performance above and beyond what we have seen from the Italian boot maker to date. Using aluminum buckles, a more substantial PU heel protector and an ankle protector with a carbon-fibre finish, the X-Desert is one of those boots to geek-out on! Between the reinforcement throughout the shell and the durable GTX liner, this is an extremely strong boot, however, TCX has cleverly combined this with a flexible chassis through careful placement of materials and accordion stretch panels over the ankle and above the heel. Whether its RawHyde Adventures or your gravel driveway, TCX supports your off-road endeavors in good form.